Note the misspelling of Straitsmouth as “Straithmouth” on this 1905 postcard from the Rotograph Co. of New York City. That aside, this is a beautiful and serene view of the island and lighthouse. 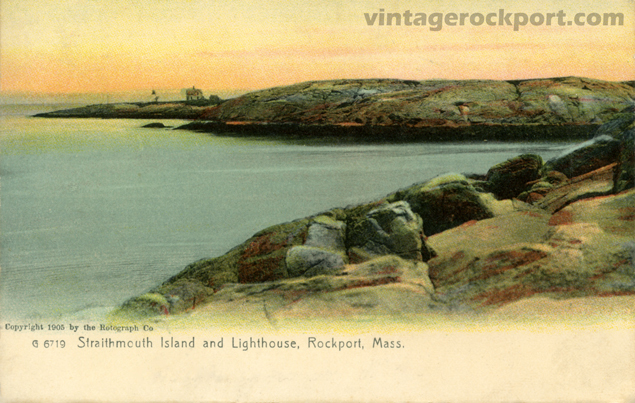 Compare this view of the lighthouse with this 1895 view and this 1909 view. There is also this 1925 view of a sloop passing between the island and the mainland. As I’ve noted before, there have actually been three different lighthouses on Straitsmouth. The first was built in 1834. It was replaced in 1851 by 24-foot tall octagonal stone tower. In 1896, the lighthouse that still stands today was constructed. This entry was posted in Uncategorized and tagged Straitsmouth, Straitsmouth Light. Bookmark the permalink.